Very few artists have specialized in just one type of painting subject. However, Rachel Ruysch, a prominent Dutch Realist artist during the Golden Age of Dutch painting devoted her entire career to painting pictures of flowers for her still life paintings. Together with landscape and still life painter Jan van Huysum, Rachel Ruysch was able to charge the highest prices for her flower still lifes across Holland during her 70-year art career as a flower painting specialist in the 17th century. Her paintings showed influences from Late Baroque and Rococo, and she was quite adept at employing chiaroscuro effects to great advantage. 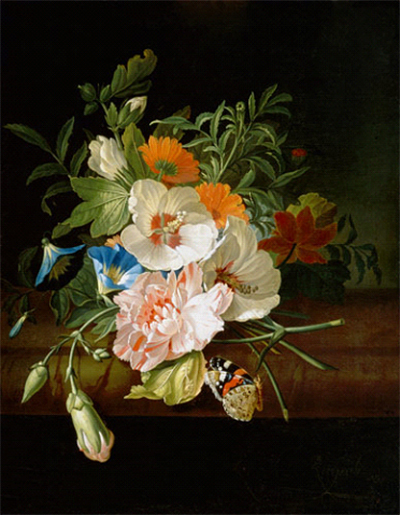 During the 17th century, most Dutch artists painting flowers tended to arrange them in formal displays. Ruysch on the other hand had other ideas, which made her oil paintings livelier. She arranged the flowers in a haphazard fashion and arranged them according to the season. Rachel Ruysch was born in The Hague on June 3, 1664. Her father, Frederik Ruysch was a botany and anatomy professor while her mother, Maria Post was the daughter of a very prominent Dutch architect Pieter Post, who, together with Jacob van Campen, started the Dutch Baroque style of architecture, which was exemplified in one of the buildings they designed, the Mauritshuis. Rachel Ruysch started to practice drawing using items from her father’s large collection of botany, mineral and animal skeleton samples. She later moved to painting insects and flowers. Being a scientist, his father recorded nature as accurately as possible, a skill that he taught his daughter. This was a skill that was forever seen in how intricately detailed her flower paintings were. Her father was also an amateur painter, so he was able to teach and encourage Rachel in her artistic pursuits. She actually created many scientific studies of insects and flowers, just like her father. Her own environment was also conducive to her artistic pursuits, as they resided on Bloemgracht or the “Flower Canal,” a beautiful and peaceful area that attracted many artists. At the age of 15, she became an apprentice to Willem van Aelst, who was a very prominent painter of flowers. During the four years that she was his apprentice, he taught her painting techniques as well as how to arrange floral bouquets in such a way that the arrangement would look spontaneous, which helped produce a three-dimensional and more realistic effect. At the age of 18, Rachel Ruysch was already selling signed paintings independently. While she took formal lessons for Willem van Aelst, who was quite famous for his complex and richly detailed still lifes with coiled compositions and unconventional and asymmetrical flower arrangements, Ruysch was also able to develop her own style. The influence of her mentor was there but she built upon her mentor’s techniques. She became a master of composition, and her choice of colors and her non-formal flower bouquets added so much vibrancy to all her work, achieving a more rounded and three-dimensional shape with the clever positioning of leaves or blooms, allowing them to droop over the sides of the container or peeking out from behind the vase. At age 25 Ruysch married a lace dealer and painter, Juriaen Pool and together they had 10 children. While she practically raised her large brood by herself, her life as a mother did not interfere with her productivity and she continued to paint until she was 83 years old. Overall, she created 250 paintings, which was quite remarkable because her flower paintings involved very detailed work. She and her husband became members of the Guild of Saint Luke in 1701. They were invited to be court painters to Prince Johann Wilhelm in 1708 and had to stay in Dusseldorf, Germany until 1716. While serving as court painters, Ruysch was also able to complete paintings for her Dutch clients. Ruysch practiced her art during the Baroque period and painting flowers became a part of the art movement in the latter part of the 17th century. Holland at that time was developing many flower varieties and gardening became quite popular, with gardeners often commissioning artists to paint their rarest and best flowers. Although most women artists were drawn to still life painting, artistic painting was still dominated by males and most women painted as a hobby because in those days it was believed that artistic genius was not something that women possess. Therefore it was very noteworthy that a woman like Rachel Ruysch would become an artist of high regard. She was considered as one of the greatest flower painters among all painters – males or females. She stood out even among her female contemporaries not only because of her depictions that were scientifically accurate and very realistic but because of her unsurpassed technique and skill that were enhanced with her artistic sensibility and sensitivity. She used dark backgrounds and dramatic lighting effects to show the beauty of the flowers just like the other artists, but her work showed more intricate details, particularly the leaves, which she considered to be of the same importance as the blooms. 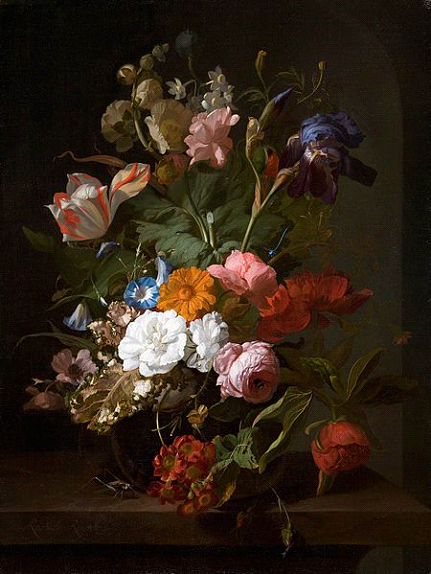 Rachel Ruysch died at age 86 but her reputation remains to this day, with many art patrons still interested in her work, and a rare appearance of one of her paintings in the art market always creates a huge buzz.